As I’ve mentioned in my previous entry, I attended a a luncheon for the Robin Tomas for Penshoppe media launch. If you’re wondering who Robin Tomas is, allow me to fill you in. Robin Tomas is a Filipino designer based in New York. He graduated from Parsons School of Design last 2002 and had since interned at Valentino and Anna Sui. He received acclaim in New York when he won the Best Reinvention of the Men’s T-shirt Award against other emerging fashion designers in the annual Supima T-shirt Design Contest. His winning piece was launched as a special edition piece in Bloomingdales’ flagship department store located at the heart of Manhattan, New York last March. Aside from this, he was also chosen as one of the three individuals to be featured as “The Best of the Philippines on 5th Avenue” by the Philippine Government. He has also previously shown a 43-piece collection under the label Tomas last May 2009 at Philippine Fashion Week. In September 2011, during New York City’s annual “Fashion Night Out”, Robin is set to launch his fall collection for women composed of evening separates at Anik Boutique along Madison Avenue. With a growing list of credentials, Penshoppe was quick to invite Robin Tomas to design a capsule collection for Penshoppe composed of sophisticated casual wear for both men and women. I think it’s quite fitting for Penshoppe to collaborate with Robin since his design aesthetic seems to be very much in sync with Penshoppe’s casual designs. According to Penshoppe’s brand director, Alex Mendoza, getting a New York based designer like Robin Tomas is perfect for continuing what they’ve already started with Ed Westwick who is an iconic New York character. This takes Penshoppe another step closer to bringing its creations to an international market. Hooray for homegrown brands like Penshoppe! Let’s continue pushing the boundaries! 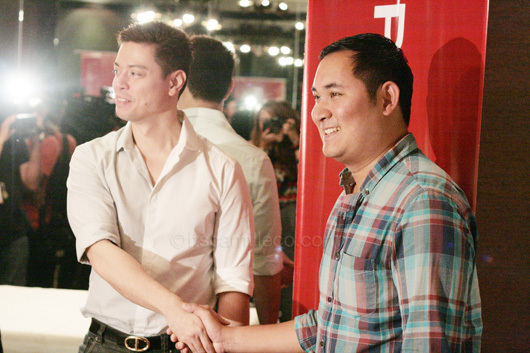 Penshoppe’s brand director, Alex Mendoza, and fashion designer Robin Tomas, seal the deal. I can’t wait to see how Robin will merge his New York training with his Filipino roots and bring a whole new flavor to Penshoppe’s designs. The Tomas for Penshoppe collection will be out early next year so keep your eyes and ears peeled. To see more of Robin Tomas’ designs, visit www.robintomas.com.